Construction has commenced on Bohème Apartment towers following $35 million of off-the-plan apartment sales in the last six months. The towers are the centrepiece of Robina Group's $250 million CityVillage development which will include 500 homes. Tower One was launched in February and sold out all of its 52 apartments for a combined $30 million. The quick sellout of the first tower led to the release of Tower Two being brought forward and buyers snapped up 20 per cent of the building's 77 waterside apartments. Preliminary civil works for the twin-tower project are expected to be completed by the end of this year, with construction on Bohème's seven-storey Tower One to start in early 2016. The remaining apartments in Tower Two are priced from just $455,000. Brisbane-based builder Cullen Group started work on Bohème this week and is using a range of innovative building techniques to fast-track construction in line with buyer demand. Cullen Group has completed more than 40 apartment projects from Lennox Head to Brisbane. 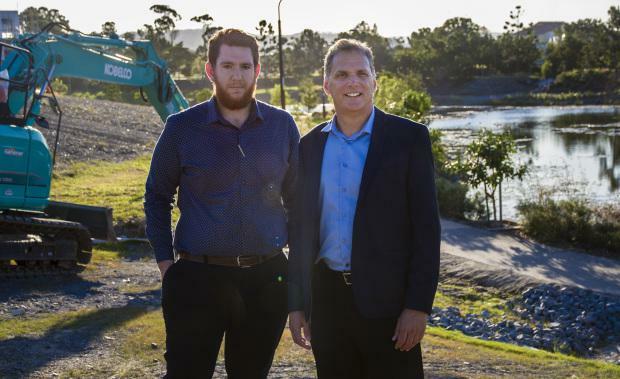 Operations manager Geoff Belford said Bohème Apartments would involve a high degree of technical innovation, including the use of a column structure rather than traditional cement blocks. "Bohème Apartments are selling fast and people want to move in as soon as possible," he said. "Concrete structures provide greater efficiency in vertical construction, so it's a good solution for multi residential projects that need to come out of the ground quickly. ""We anticipate that the entire two-tower, 129 unit Bohème development can be completed within 24 months. "Bohème Apartments are the first apartments available in the CityVillage masterplan and will include a unique podium-level residents' retreat featuring a lakeside saltwater pool, barbecue and recreation area, and a street level cafe. A full-scale two bedroom display suite, styled by The Block's Carlene and Michael Duffy, has been built on site to showcase the striking on-trend design and high quality finish of the apartments. Demand for Bohème has echoed the stellar success of the wider CityVillage community by acquiring more than $100 million in sales to a broad range of buyers keen to take advantage of the rapid growth underway in Robina. Robina Group director Tony Tippett said Bohème and CityVillage were drawing interest from a broad range of purchasers who recognised the growth potential opportunities on offer in South East Queensland. "Gold Coast City is rapidly expanding with a population predicted to double by 2050," he said. "Robina is geographically central to Gold Coast City and Bohème is just 250 metres from Robina Town Centre. Our buyers love the fact that Gold Coast City's top schools and medical facilities are only minutes away. "Interstate buyers can see a great opportunity of investing in Gold Coast City areas such as Robina, as prices here are still affordable compared to Sydney and Melbourne. "There is currently over a billion dollars of investment underway in Robina with a new private hospital being announced only last month and many other projects underway. "Bohème Apartments allow buyers to be a part Robina's unprecedented growth,” he said.